There are probably many hundreds (or maybe thousands?) of happy DEiXTo users around the globe. Site traffic, downloads and the emails we receive support this. We list a few heavy DEiXTo users bellow. We thank them for sharing with us a few details on how they use (or used) DEiXTo. fuelGR is a family of applications that display on map, fuel stations and prices of the Greek fuel market. The application is available for Android, Windows Phone 8 and Web. A Windows Desktop version was also developed but is out of operation after Microsoft merged desktop and phone stores. A UWP version for Windows 10 will soon replace all Windows versions. You can find more in the fuelGR web site. DEiXTo was used in the very early stage of fuelGR (back in 2014), during the proof of concept stage, to collect data from the Greek Fuel Prices Observatory (a Greek state maintained site). We are actively participating in the development and improvement of these apps. Check out the latest news for these apps in the fuelGR facebook page. The Open Health Systems Laboratory (OHSL) focuses on building global team science consortia to address key questions of medical science. The Global Cancer Collaboratory project is such an example. It aims at aggregating information from cancer center web sites into some central VIVO hubs in order to bootstrap the creation of research networks. A good bit of their labor will involve using DEiXTo to extract structured text from existing web sites. They will then transform it a bit and map it to the set of ontologies contained in the VIVO platform. 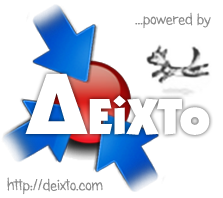 DEiXTo has been used by openarchives.gr, a very popular federated search engine harvesting many Greek digital libraries and institutional repositories. Check what they say (in Greek) about DEiXTo. Michelin Maps and Guides has successfully used DEiXTo to help their customers find the maps they need for their travels in France. Such data intensive applications are hard (if not possible at all) to build with manual data entry. DEiXTo powers “Gestión de Reputación”, a Spanish innovative web service that helps people find out about their digital reputation and improve it. “Gestión de Reputación” provides reputation management for individuals and offers free reports that let users know what the web says about them. Check their testimonial in our home page. DEiXTo generated wrappers have been successfully used inside “dbWiz”, an exciting federated search tool. dbWiz interacts with bibliographic databases and other online resources by web access and DEiXTo can be used to extract and consolidate in real time their search results. dbWiz is a part of the Simon Fraser University Library’s reSearcher suite of open source software. DEiXTo powers the Hellenic Aggregator for Europeana, created by Veria Central Public Library. DEiXToBot based Perl scripts enabled the data extraction of the “Lilian Voudouri” Music Library of Greece and the Corgialenios Digital Library in a format suitable for further processing. Once extracted, the data was repurposed and transformed into Europeana Semantic Elements (ESE) metadata format so that it could be inserted into the aggregator’s database. DEiXTo is being used by EXOS INDIA, a Business Process Outsourcing company offering actionable insights and cost savings for enterprises in a wide range of industries. With proven experience in delivering high quality solutions for clients across US and Europe, their management team has deep expertise in Data Entry, Web Research, Strategy Support, Market Intelligence and other Administrative Support services. euSDB, hosted at the University of Mainz, is the largest freely available search index for material safety data sheets in the German language. One common portal to find documents from more than 350 manufacturers. With GUI DEiXTo the project is able to scrape webpages from hundreds of manufacturers with a minimum of time. Article numbers, product names and CAS Numbers are extracted and become searchable. The euSDB portal helps users to fulfill their legal requirements. DEiXTo is being used by YOUTransport, an Italian website that allows users to ask for transport quotes. As soon as a transportation request is made, it is directly and simultaneously forwarded to all the transporters who can really fullfill it. They use DEiXTo in order to scrape data from websites of interest.